This past weekend the StoreYourBoard crew got out on Lake Anna for some wakesurfing. We hit the lake early to beat the crowd (and the rain) for what turned out to be a really solid session. Check it out! 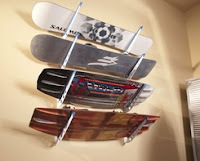 This wooden ski storage rack will hold 4 pairs of skis on your wall along with poles and other gear that you want to store with your skis. Simple and practical, this ski rack is a great way to protect your skis when they're not in use by storing them safely in your garage, basement, shed, laundry room, mudroom, bedroom or wherever else you store your skis. Aussie ripper Taj Burrow conquered an upset-filled field to win the 2013 Hurley Pro, defeating fellow mate Julian Wilson in the finals to claim the victory. 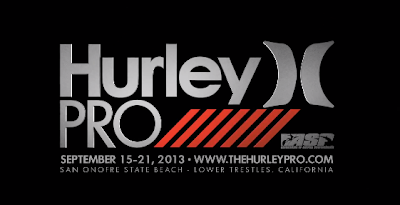 The Hurley Pro proved to be the most unpredictable event of the season so far, with neither of Kelly Slater or Mick Fanning qualifying for the quarterfinals for the first time in 2013. Taj and Jordy Smith (semis) used their strong finishes to move up 1 place each in the overall rankings to 3 and 4, respectively, gaining some ground on Mick and Kelly at 1 and 2. Unfortunately, the wakeboarding and boating season is coming to a close for many of us as October approaches. That means it’s time to start thinking about winterizing your boat. Winterizing your boat is of critical importance and should not be an afterthought! Taking the time to properly winterize your boat will save you significant amounts of cash and headache come spring time, and will prolong the life of your boat. On a similar note, if you know your boat is in need of repair, then fall and winter are the ideal times to get work done. Marine mechanics will be in a seasonal lull and that means you’ll get your boat back quicker (and potentially cheaper). Check out this picture of our skateboard racks installed for skateboard and scooter storage at Sylvan Middle School, in Citrus Heights, California. The administrative team at Sylvan wanted its students to exercise and stay healthy and one of the ways to do so was to skateboard or scooter to school. 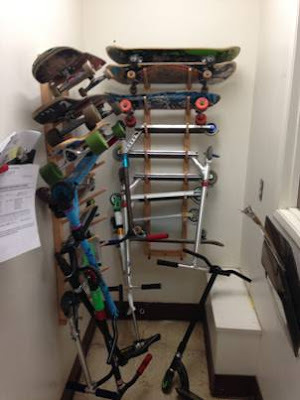 To encourage their kids to do this, they bought skateboard wall racks to store the students' skateboards and scooters who took the school up on the exercise initiative. The participation has been strong and the kids and administration are enjoying the racks! We are impressed by Sylvan Middle School's step to really connect with its students. That's one of the things that school should be about. More schools need to follow Sylvan's lead. Saturday night Surf Expo moved to Typhoon Lagoon for the industry party thrown by Sanuk. And it wasn't your typical family-friendly atmosphere at Typhoon Lagoon either. Team StoreYourBoard was in Orlando this past weekend for Surf Expo, the largest boardsports trade show in the world. With over 20,000 people in attendance, including exhibitors, buyers, team riders, swimsuit models, surfboard shapers and more, Surf Expo was definitely the center of the action sports universe for the weekend. Not a fan of just skateboarding? Maybe you like to wakeboard to cool off during the summer and hit the slopes on your snowboard when it’s too cold to skateboard. One of the best things about StoreYourBoard racks are their versatility. Here is a list of a few of our racks that you can use to store not only your skateboard, but your snowboards, skis, and wakeboards as well. One of SYB’s most popular racks, the triple rack is strong and durable. 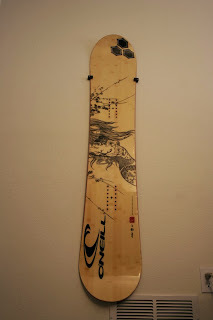 It is capable of holding not only your skateboard, but can sustain the weight of your snowboards, too. An added bonus, if hockey is more your thing, this rack is a great way to store your sticks and skates. This SYB original is one that can handle your wakeboards, snowboards, and skateboards. Stylish and functional, the claw rack securely supports boards 1 1/8” wide and cushions the board with rubber protective arms. 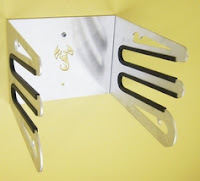 Made of aluminum, the claw rack is available in stealth black or aluminum. The most multipurpose board StoreYourBoard has to offer. The Snowboard Home Storage Rack is perfect for storing your snowboard and all of your gear. Made from steel, the rack is capable of holding up to eight boards, this rack can handle your surfboards, kiteboards, wakeboards, skis and whatever else you need. Known for being durable, the Snowboard Home Storage Rack will travel with a rider throughout their boarding career. Check out StoreYourBoard.com for more racks that can fulfill all of your storage needs. 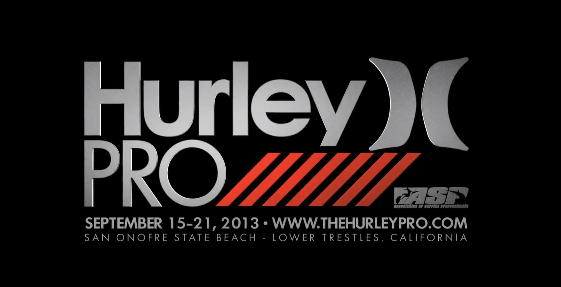 The WCT makes its only stop in the U.S. at Lower Trestles, San Onofre State Beach, California, for the Hurley Pro beginning next Sunday, September 15th, with the waiting period extending to the 21st. A familiar storyline has played out through the first 6 events of the season, with Kelly Slater and Mick Fanning breaking away from the rest of the world's best surfers. Kelly, fresh off his finals appearance in Tahiti, is looking to claim his third win of the season and his fourth straight victory at the Hurley Pro Event. Mick is actually still looking for his first win of the season, but his consistency has kept him neck-and-neck with Kelly, by making at least the quarterfinals of all 6 events this season. Something's got to give, right? "If you're lucky enough to be in the water, you're lucky enough." 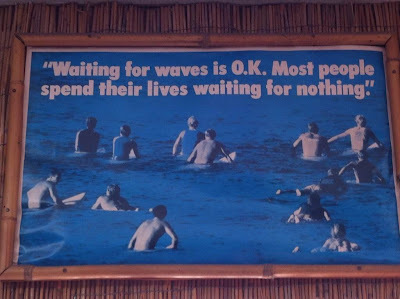 Sometimes waiting for waves can be frustrating. Especially when I'm in a hurry and running out of time in my session because I have to be somewhere else. A lot of times that somewhere else is work. 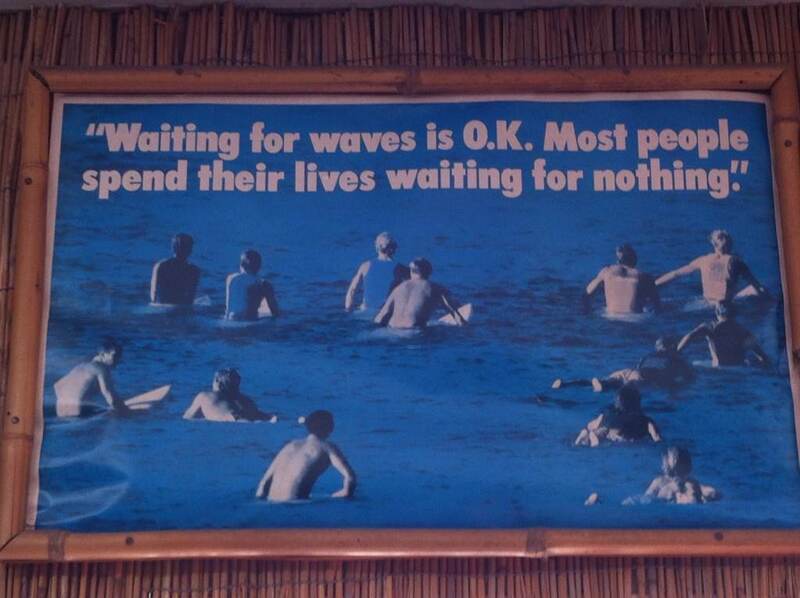 Then I remember that being at work is way more frustrating than waiting for waves. That thought alone helps me relax as I'm sitting out in the water.